I have a confession to make: before today I had not tasted Nutella. Shocking I know, but it’s true. Obviously I’ve had chocolate and hazelnuts before, and even had the two together, but not once had I eaten this amazing spread. It is probably a good thing really, I can see myself buying (and eating) a lot more of it. I ate three spoonfuls before even starting these cookies! Fragrant with hazelnuts and coffee this shortbread melts in your mouth. 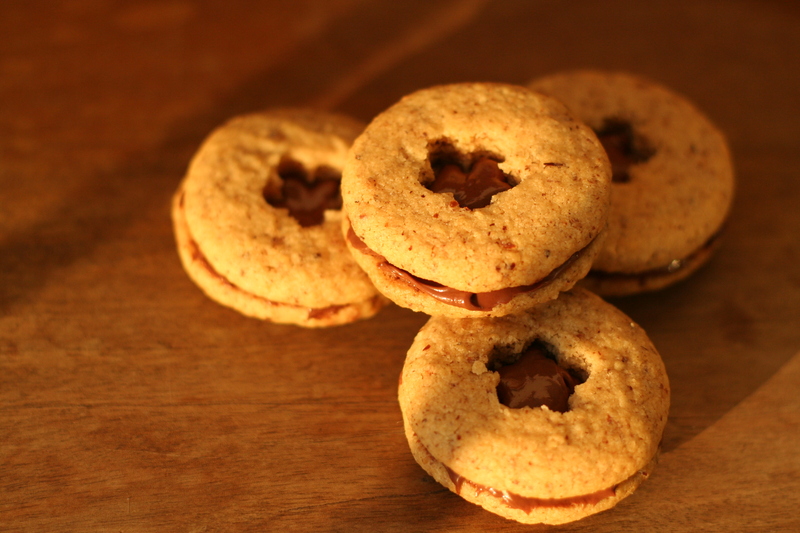 The rice flour keeps them light and the hazelnut meal gives a strong flavour and interesting texture. 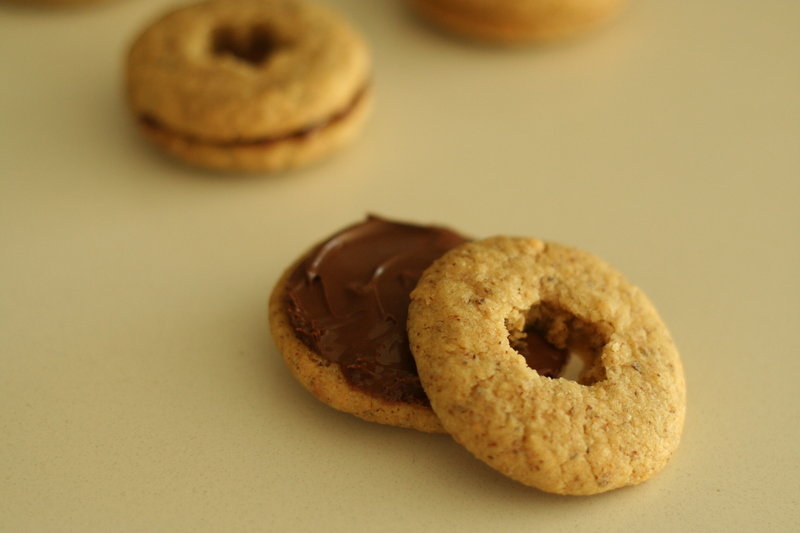 You could easily substitute almond meal or even macadamia meal if you like, but I found these cookies went perfectly with a spoonful of Nutella sandwiched between them. 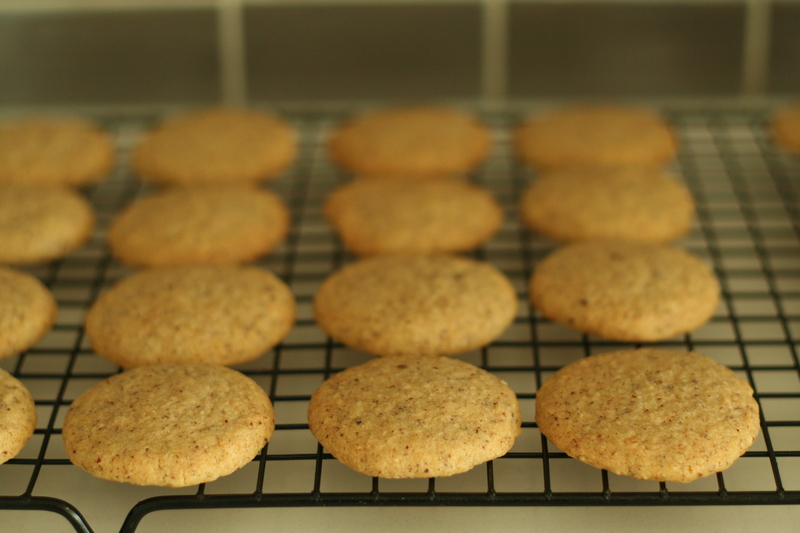 This shortbread is quite easy to make but a little temperamental to work with. I recommend placing the dough in the fridge for a while before shaping into cookies to avoid getting your hands too messy. I cut small shapes out of half of my cookies while they were still warm from the oven although you can try and do this before you bake them but they may be too soft. Also don’t let them cool completely and then try to cut them as they will just crumble. I think this recipe will quickly become a favourite in this house, not least of all because it gives me an excuse to eat more Nutella! Preheat the oven to 160° and line baking trays with baking paper. Sift icing sugar into a bowl and add the butter. Beat on medium speed until fluffy and pale, about 5 minutes. Add the hazelnut meal, flour and coffee and stir until combined. Refrigerate about 30 minutes or until easy to handle. Roll teaspoon sized balls of the dough and place on baking trays. 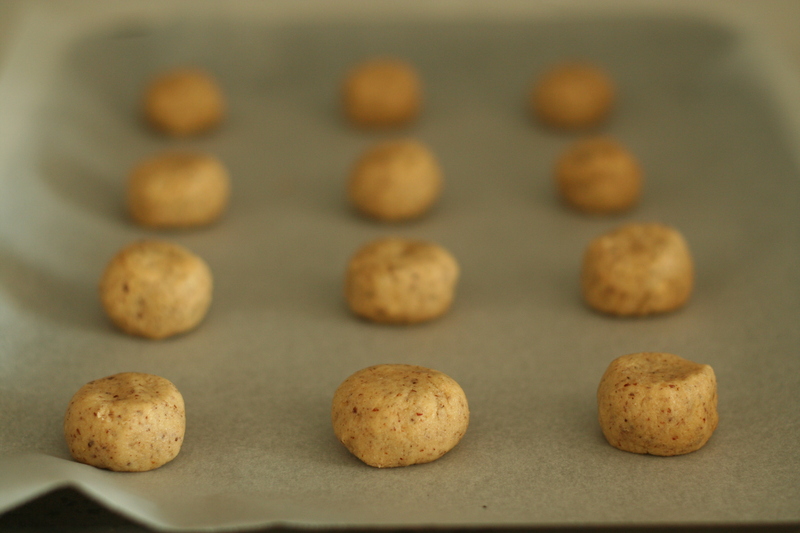 Flatten each ball with the bottom of a glass (use a piece of baking paper between the glass and the dough if they stick) and bake for 10-15 minutes or until lightly golden. If cutting out shapes from your cookies now is the time to do so. Be very gentle and use a toothpick to clean up any edges. 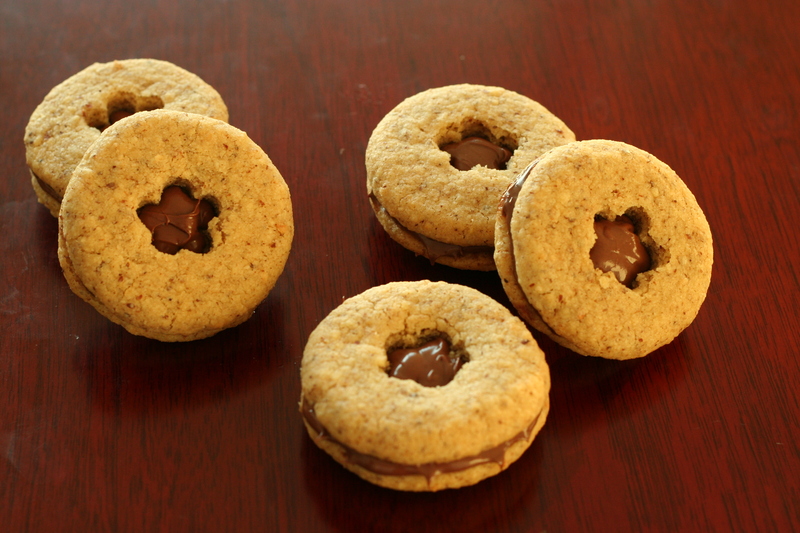 Once completely cooled spread Nutella on one cookie and sandwich with another. Pssst! I’ve NEVER had Nutella…could today be the day? These look delicious!!! Trust me, once you’ve tried it you’ll understand why everyone raves about it! Mmmm…with a cup of tea, perfect! 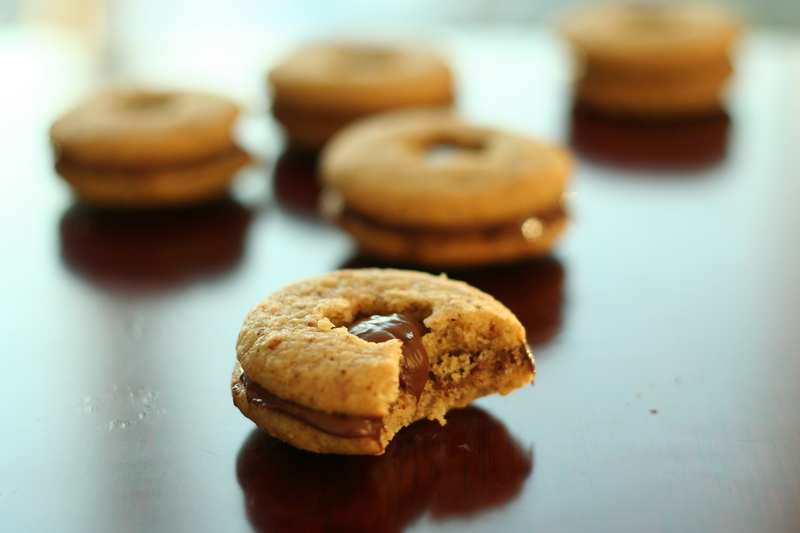 I’ve loved everything I’ve seen on your site–you have fun in the kitchen:-) Nutella is indeed delish. If you’re looking for ways to use it, hunt down the Nutella pound cake recipe that’s all over the web. A quick google search should turn it up. I only make it twice a year or so as it’s way too irresistible. Ohh I may have to try that! Brilliant idea! I’m thinking about trying this with a berry compote swirled with it. Alright if I post it? Such pretty cookies! I’m shocked you’ve never had Nutella before although that probably means you haven’t eaten tubs of it by the spoonful as I have! Oh, YUM! I’m crazy for hazelnuts, and these look beautiful and delicious. 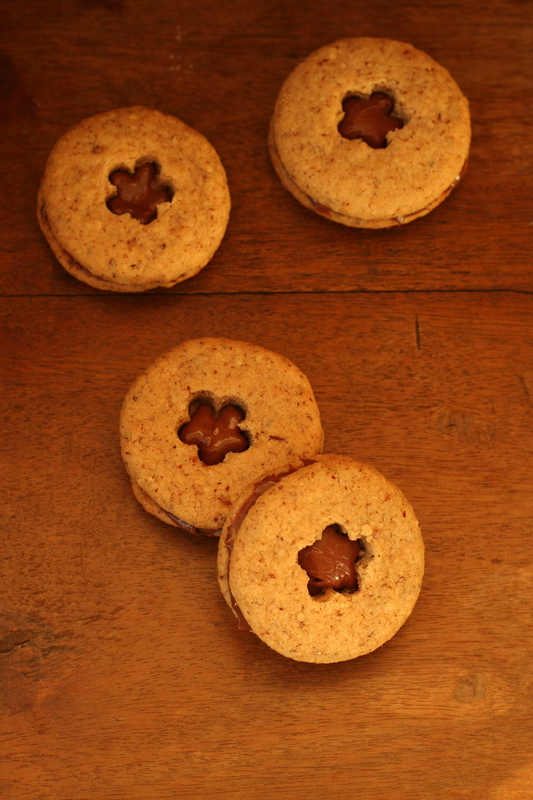 There’s nothing better than two cookies with filling in between! Those look mouth watering good! ahh.. i wanna reach into the screen and grab one! oh my goodness, these are so cute!